At the Hina Matsuri (Doll Festival) people throw hina dolls into a river to take illnesses away from children. 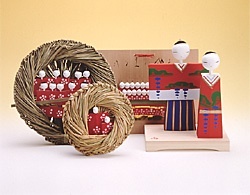 Nagashibina is a ceremony in which disasters that can befall children are symbolically transferred to human-shaped dolls made of paper or plant materials. These dolls are sent down the river to exorcise these disasters and pray for the health of children. This ancient Japanese tradition has been practiced for approximately 1,000 years since the middle of the Heian period. Starting around 600 years during the Muromachi period, it came to be performed on March 3 of the lunar calendar (the first Day of the Snake in March). A total of 1,500 people from the general public, who applied to take part, participate on the day of this ceremony. Before that, children from the Taito City Ishihama Kindergarten are specially allowed to participate by performing nagashibina from the Shinsui Terrace and boats with hina decorations. At the same time, balloons shaped like doves (watch on Youtube) are released by women wearing long-sleeved kimono (an Asakusa specialty) together with the President of the Asakusa Tourism Federation and Taito City Major Yoshizumi (starts at 12:00 p.m.). The festival is held annually on the Sunday before March 3. Nagashi-bina is an ancient custom and ritual that involves dispelling impurities and misfortunes by floating dolls away on water. In earlier days this took place all over Japan, but the practice has died out in most areas. In rural regions, only in Tottori-shi and Mochigase-cho in Tottori Prefecture does nagashi-bina survive today. In this rite, dry straw is woven into a boat, which carries a pair of male and female dolls to be cast adrift in the river. As it has become quite a rare event, in recent years it has come to attract visitors by the busload.